Calling all fans of salmon pink peonies: Salmon Chiffon is the one that’ll make your heart beat faster. Of all the varieties that have this popular colour, Salmon Chiffon has by far the largest, most impressive flowers. 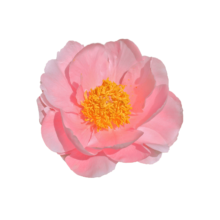 Salmon Chiffon is a double-flowered peony with salmon pink flowers. The large buds are about 40 mm wide and bloom into big flowers that can reach a diameter of 20 cm. This peony has a strong stem and sturdy leaves. A nice characteristic of Salmon Chiffon is that it keeps getting fuller as the years pass by. Three-year-old plants still have a lot of stamens in the flowers, five-year-old plants have flowers that are almost completely filled with petals. We’re curious what the flowers of even older plants will look like! Roy Klehm bred Salmon Chiffon and registered the variety in 1981.